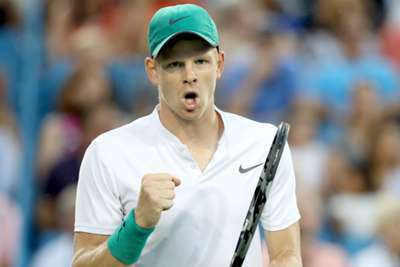 British number one Kyle Edmund made a winning start at the ATP Cincinnati Masters, beating wildcard Mackenzie McDonald in straight sets. The Masters 1000 tournament lost its headline act on Sunday after world number one and top seed Rafael Nadal withdrew in a bid to stay healthy following his Rogers Cup success. Edmund, meanwhile, earned his first Cincinnati victory by defeating McDonald 6-3 6-2 thanks to 10 aces and just one point dropped on his serve. Next up for Edmund is either Frances Tiafoe or Denis Shapovalov. @kyle8edmund sets up a delightful possible R2 matchup @CincyTennis. Frenchman Adrian Mannarino saved a match point in his 6-7 (7-9) 6-2 7-6 (9-7) victory over Marco Cecchinato. Mannarino had trailed 6-5 in the third-set tie-break before rallying to book his spot in the next round.